Blog Make Pork Chops and Cherry Couscous for Four People for Under $15! Make Pork Chops and Cherry Couscous for Four People for Under $15! Is your wallet on a budget, but your stomach isn’t? We get that. We also understand that having to feed four people tends to be a bit more pricey than just yourself. But, fret not. At Basket, we value a solid budget recipe – one that makes you look like a gourmet chef, when in reality, you spent less than 15 bucks for the whole meal. 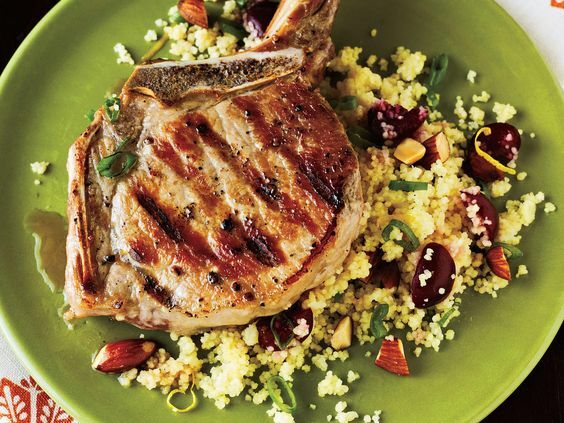 For today’s recipe, we’re tackling pork chops with cherry couscous. Interested in a gourmet dish for four on a budget? Keep on reading. To begin your ballin’ on a budget dish, first build your shopping list on Basket. This part is pretty easy. Simply go to the Search and Compare tool on the bottom left of the screen and type in the ingredients you might not have on hand quite yet. For example, if you don’t happen to have dry-roasted almonds in the house, type “dry-roasted almonds” into the search bar. Pick which brand you love best (or the price you love best), and click the + sign next to the item to add it to your shopping list. Continue adding each item that you’ll need to purchase from the store. Once you’ve finished your list, click the Compare Prices tool to find which store near you carries your list at the lowest price. Alright, let’s get down to business. You’ve got four hungry mouths to feed and you’ve loaded up your shopping basket with the necessary ingredients. 1. To begin, pit the cherries and coarsely chop them. In case you’re not familiar with the Food Network, this simply means to roughly chop each cherry, leaving each pieces approximately 1/2 inch big. Next, dice the green onions, and chop the almonds (more finely than the cherries). 2. For the grated lemon rind and lemon juice, slice a whole lemon in half and squeeze its juice into a clean bowl. Next, use a grater to shave off 2 teaspoons of rind. 3. After prepping the ingredients, preheat the grill to medium-high heat. If you don’t have access to a grill, place a large skillet on the stove over a similar heat. As that warms up, place one cup of water on the stove to boil. 4. Brush both sides of the pork chop evenly with 1 tablespoon of olive oil, and sprinkle with 1/2 teaspoon of salt and 1/4 teaspoon of black pepper. Once the pork chops are evenly coated, coat your grill or skillet in cooking spray, and place the chops on to cook. Cook for four minutes on each side, or until they’re cooked thoroughly and reached your preferred temperature. Remove from heat and allow the chops to rest for 5 minutes. 5. While the pork is cooking, place 1 cup of plain, uncooked couscous into a large bowl. Pour in 3/4 cup of boiling water into the bowl, cover, and let stand for 5 minutes. After the allotted 5 minutes, uncover and fluff with a fork. Mix in 2 tablespoons of oil, 1/2 tablespoon of salt, and 1 cup of cherries. Next, fold in 1/2 cup of green onions, 1/3 cup of dry-roasted almonds, 2 teaspoons of grated lemon rind, and finish with 2 tablespoons of lemon juice. 6. Voila! Your masterpiece is ready to serve. Portion your cherry couscous onto the center of a clean plate, creating a circular pattern. Layer the pork chop on top, and garnish with a cherry. By now, you’ve probably realized that Basket is the first place to go to avoid overpaying for your groceries. But, it’s not just our price-comparison wizard (though, that’s pretty helpful) that makes this dish so inexpensive. The shining star of the couscous is the cherries. Well, summer is cherry season! From April to August cherry season reaches its peak, and the price of cherries per unit declines along with it. Therefore, in addition to being a vibrant, sweet addition, it’s a cheaper produce to incorporate into the dish. Next, consider the meat. For this dish, we’re using bone-in, center cut pork chops. Though not the filet mignon of the pork world, this cut has its definite perks. For one, it’s flavorful and easily accessible. Secondly, it’s much more cost efficient than a boneless chop. Opting for this cut shaves a whole lot of dollars off your grocery list. Finding a pack of four 6-ounce chops and adding in a simple couscous mix and doctoring it up can create a fantastic dish that feeds four fully without breaking the bank. Plus, with that presentation? Everyone at the table will think you spent a fortune. Will you be trying this recipe out for yourself? Send us a picture over the comments below, on the Basket Facebook page, or Tweet us a picture @BasketSavings!